Tipping: What's the right amount? The move immediately prompted debates of all sorts. Among travelers, the chatter centered around what's an appropriate amount and who else to tip along the way. Marriott (MAR) didn't specify, but the American Hotel & Lodging Association suggests leaving housekeepers a tip of $1 to $5 per day. There was no guide for tipping others who help in your travels - the bellhop, the valet or the cab driver. Related: Mariott: Tip your housekeeper! 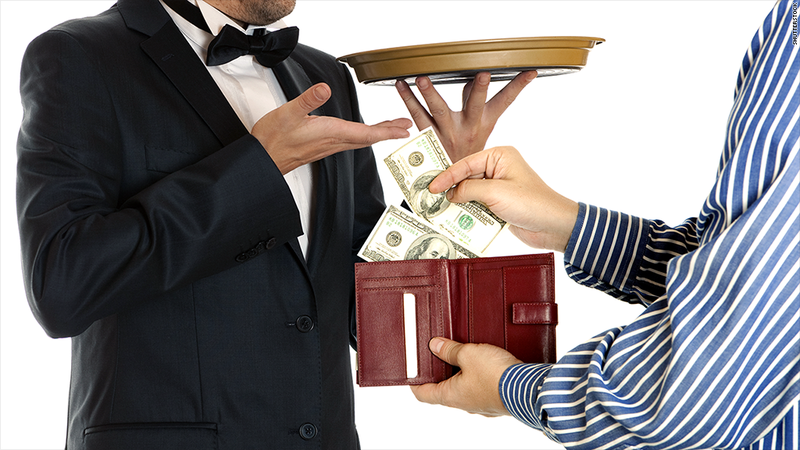 Etiquette pros agree that tipping can be awkward, especially in unfamiliar environments. The number one rule of thumb: When in doubt, tip. But remember to ask if tips are accepted, since there are some establishments that have a "no tipping" policy. "Let me tell you, they will tell you if they accept tips," said Jacqueline Whitmore, founder of The Protocol School in Palm Beach. Taxi Driver: 10-15% of the bill and add $2-$3 for every bag the driver helps get in and out of the vehicle. Private Car Service: 20% of the total, but be sure to check the bill to see if the tip is already included, especially if the car is pre-paid. "If someone else is paying for it, add a tip," said etiquette expert Elaine Swann. "Go with a dollar amount based on distance: $5 for shorter trips and $10 or more for longer distances." Shuttle Drivers: $1-$3 per bag if the driver assists with loading and unloading. If the driver doesn't help, the experts said it's acceptable to skip a tip. Wheelchair assistance/Skycap: $5-$10 for assistance getting through security and to the gate or for plane-side pickup. For skycaps, tip $1-$2 per bag. Any person that helps with your bags should get tipped $1-$3 per bag, including doormen, bellman and greeters. If a doorman hails a cab, tip $1-$2, said Whitmore. Housekeeping: $2-$10 a day depending on the quality of service and the hotel. Because staff can vary each day, experts advise leaving a tip daily. If a staff member brings up extra towels late at night or fulfills another request, tip $1-$5. "If someone is coming to your floor that wouldn't ordinarily be there, give a tip," said Whitmore. Room Service: 10-15% of the bill if it's not already included. "If it is, you can give $1-$5 to the delivery person," suggested Patricia Napier-Fitzpatrick, founder of the Etiquette School of New York. Concierge: $10 or more depending on the level of engagement. Scoring hard-to-get reservations or tickets should be rewarded with more, said Napier-Fitzpatrick. There's no need to tip for dining or activity recommendations. Tour Guides: $5-$10 for a group tour, or 20% of the cost for a private guide. "If it's a bus tour, don't forget to also tip the bus driver a couple bucks," said Napier-Fitzpatrick. Wine Sommelier: Optional. But if service is exceptional, Whitmore recommended a tip of 5-10% of the wine. Valet: $2-$5 each time an attendant brings the car.